What type of motor bike does Santa ride? What game do reindeers play in their stalls? And finally, what did Adam say to his wife the day before Christmas? You can immediately sense the level of desperation when someone has to resort to lame Christmas jokes just to get into the Christmas spirit. I’m quite certain that many of you have been trying desperately to get into this Christmas spirit for weeks. Playing Christmas carols in your car since November. Putting up the Christmas tree and decking it with lights, late November. Going on your Christmas shopping sprees or just frequenting the malls just to savour the Christmas lights and decorations, and to soak in all that Christmassy feeling. Still, despite your best attempts, many would be lamenting that it just doesn’t feel like Christmas this year. It’s a “not-so-merry Christmas”!. 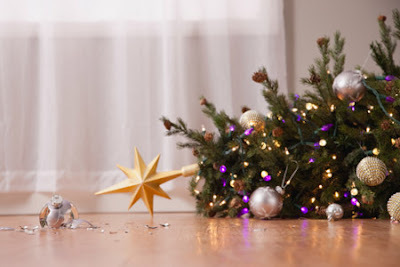 We could blame this on the seasonal advertising, the saccharine sweet lyrics of popular carols and the pristinely fairy tale perfect decorations in the malls. They paint the holidays with such strokes of happiness and magic, that it is rather impossible to live up to such perfection. Reality really never looks as good as it does in the commercials. It is not as if Christmas has fallen short of our expectations but the real cause of our disappointment is that we remain fettered by our feeble imaginations and cannot see Christmas for what it truly is. Trying to force Christmas into the pattern of the world or our own narrow key-hole world view, is an exercise in futility. What most people forget is that Christmas isn’t about you, and it isn’t dependent on how you feel about it and it can never be something you manufactured. The truth of the matter is simply this; Christmas, as the name obviously suggests, is about Christ. Yes, we are here for the Mass of Christ. Christmas is not just a holiday, any holiday; it is a “holy” day. Our Christmas joy is not the sum of what we have done or not done, but it is because of what God has done for us. He has given us Jesus, the Hope of all ages. That should be the cause for endless joy. And yet the Prophet Isaiah does not focus on the darkness of their predicament. In fact, he presents to the people the glad tidings of joy they so needed to hear. The prophecy of Isaiah promises the restoration of Israel. “No longer are you to be named ‘Forsaken’ nor your land ‘Abandoned’, but you shall be called ‘My Delight’ and your land ‘The Wedded’; for the Lord takes delight in you…” How could this be possible? It all seems impossible and yet tonight attests to the moment that all things are made possible in God. To borrow a phrase from G.K. Chesterton, “Things that cannot be, and (yet) that are.” For man, it may appear impossible, but for God, all things are possible! It is possible simply due to God’s amazing grace. This is what the genealogy of Jesus Christ according to St Matthew seeks to do – “Things that cannot be, and (yet) that are!” God will work through ridiculous circumstances to transform what seems impossible to become possible. In order to save His people; He will spare no effort. There comes a point when we are tempted to cut our losses and call it quits. But not God. No matter how unfaithful the Israelites were, no matter how hopeless things seemed, no matter how impossible it was to keep going, God never abandoned them, God kept going. The genealogy becomes an account of God’s sublime faithfulness. Through wars, famines, betrayals, slavery, exile and turmoil, God is going to keep His promise. And if one were to examine the names listed in the genealogy, you can easily come to the conclusion that God will work through ridiculous people to fulfil His promise. Man’s wilfulness, sinfulness and brokenness cannot hinder the purposes of God. The story of Christmas points at the insurmountable splendour of grace in the face of impossibility. It cannot be...and yet it is. Into time and human history comes a reality that is timeless, eternal. The timeless event only intersects with our regular time in this night. As an ancient hymn says it well: In the stillness of the night, when all the world was at peace, when all was still, the eternal Word leapt down from heaven. The One whom the whole world cannot contain enclosed himself in a woman’s womb in a timeless moment of human history. A world that was on a certain collision course with its own destruction, was saved at the very last moment by a child who was born in impossible circumstances and yet He survived. The Son of God became the Son of man in order to seek and to save that which is lost. Many would cry “impossible!” These are all things that cannot be...and (yet) that are. Listen, no matter what deprivations you might be experiencing tonight, no matter how lonely your life might be, no matter how sad it might be, no matter how painful your situation, no matter how bleak the Christmas season or the future, no matter what dungeon or prison cell you might find yourself in, no matter how strong your fears and how terrifying the prospects of the future might be to you, know this, you are not forsaken; you are not abandoned! No matter what goes wrong in this life, no matter what is not the way you would like it to be, no matter how much unfulfillment you face, know this, you are and will always be God’s delight! There is no need for us to trawl the internet, shop till we drop, or drink ourselves silly to create a feeling that can never be manufactured nor sustained. But we can celebrate with full hearts this Christmas knowing that we are profoundly loved. You may think that all of this is ridiculous and even impossible, but then tonight is the night where “all things that cannot … and (yet) that are.” That is what makes Christmas so magical! That is the real message of Christmas–every year. Everything about Christmas is so improbable. And yet it is all true. The Forsaken will be known as God’s delight. The Abandoned would be loved beyond our most creative imagination. The Lost would be Found and redeemed. The Hopeless Sinner would be offered forgiveness and a path back to the Light. Tonight, that improbable and even impossible story begins anew. Tonight, we celebrate the things that cannot possibly be....And yet they are. We celebrate God’s unfathomable love. Tonight we celebrate the Truth that our Salvation has arrived. Indeed, He is Here!